Keep your kitchen sink draining and your faucets working when you depend on plumbing solutions from All-n-One Plumbing. Do you need help with a garbage disposal installation give us a call at (816) 886-7600 for fast, reliable solutions today. Make sure to take advantage of the special offers and savings available on our coupons page before you call. Your kitchen faucets and sinks see as much use as any other major appliance in your home, which is why it’s important to make sure that they are properly maintained and serviced; otherwise, you may find yourself with a plumbing emergency on your hands! At All-n-One Plumbing, our technicians are happy to visit your home and help you maintain the quality and efficiency of your kitchen plumbing. If your faucets are leaking it could be costing you much more than your patience as you hear the drip-drip-drip of water from the other room – it could be costing you a lot on your water bill, too. Keeping faucets in proper working order can save you on your water bill so make sure to schedule a professional inspection and repair when you notice prolonged leaking. All-n-One Plumbing specializes in garbage disposal installation. Many homes in Independence, MO and the Greater Kansas City area have garbage disposal units installed in their sinks. These devices shred food particles and debris so that they are small enough to be washed away in your pipes, but when they stop working food can get stuck and create foul odors. If this happens, give us a call for speedy garbage disposal repair or garbage disposal installation services. Is Your Sink Acting Up? Clogs can often cause sinks to start backing up, and can be signs of larger issues with your kitchen plumbing. If you have noticed water or food backing up from your sink while water is running, it may be time for a plumbing inspection. Get flat-rate drain cleaning: Do you need your drain augered? We can do it for $99 if it’s shorter than 100 feet and has an accessible clean out – that’s our guarantee to you. Family owned, local business: Our owners and technicians live in the same communities as you do, and are committed to your best interests. Expect quality service and professional attitudes: Our specialists are committed to your customer experience and to finding personalized solutions to a variety of problems. We’ll submit a bid for free: Choosing the right plumbing company can feel overwhelming, which is why we offer free, no-hassle estimates for service. Our commitment is to your experience: We love meeting new customers and helping them solve their problems, and it shows in the level of quality we deliver. 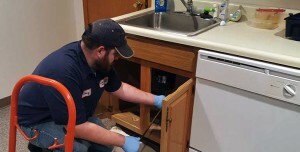 Our goal is to help every homeowner in Independence, MO and the Greater Kansas City area make sure their kitchen plumbing is working perfectly. Call (816) 886-7600 for expert kitchen plumbing services and learn more about our commitment to you. Your experts in Bathroom Remodeling, Drain Cleaning Services, Gas Line Installation & Repair, Hydrojetting, Kitchen Plumbing, Repiping, Sewer Line Repair, Sump Pumps, Toilet Installation & Repair, Video-Plumbing Inspection & Sewer Inspection, and Water Heater Services.